Rajdeep Sardesai’s personal views for Modi are no more a secret. From remote villages in Bihar to posh corridors of Madison Square, Rajdeep — as a preacher, as a boxer, as a saint, as an anchor — has left no stone unturned to express his visceral hatred for Modi. India, as a democracy, has always tried to protect personal beliefs and opinions of individuals. After 2014, it was feared that Modi government will strangulate freedom of expression, but ironically, the attacks on Modi didn’t attenuate, rather they grew manifold. However, Rajdeep is much more than an individual opinion holder; he is an opinion maker. He heads and has headed top-positions of media houses which act as eyes and ears of the nation. With such pivotal accountability, one is expected to act prudent and responsible. Sadly, Rajdeep differs to maintain that, again and again. Since then, his concerns and criticisms have remained intact in various forms. From subjugation of lower classes to sufferings of patient undergoing medical emergency, his tweets have covered a wide spectrum of narratives. Yday, met aam admis in queue: most looked harassed; today, met netas in Parliament: all smiling! Yeh hai India! 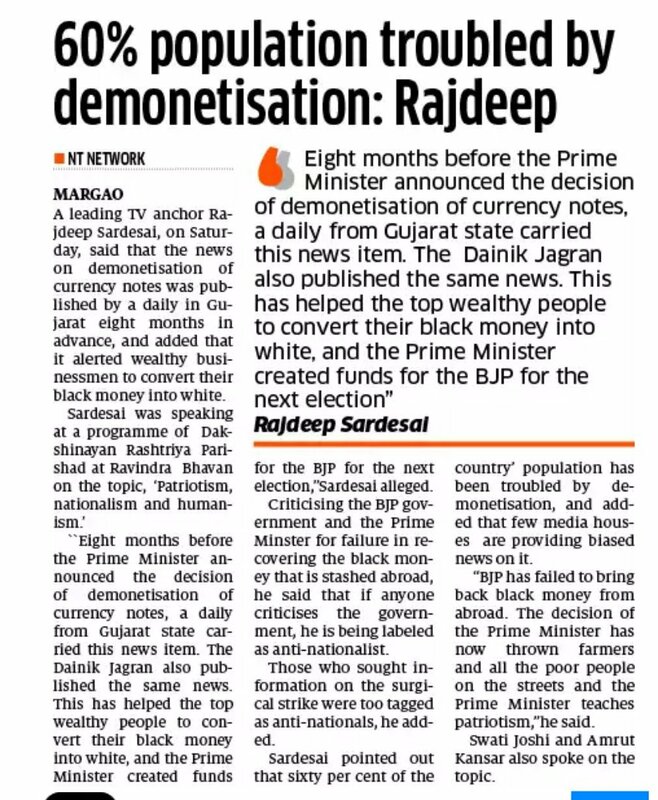 A recent article published in Navhind Times, a Goan daily, claims that Sardesai pointed out that sixty per cent of the country’ population has been troubled by demonetisation. Sardesai also added that few media houses are providing biased news on it. Interestingly, on-the-field reactions to Rajdeep’s queries are substantially different from tweets published by Rajdeep. The following video demonstrates how Rajdeep was trolled when he tried to nudge people on the “inconvenience” factor. Contrary to the views published in the Navhind Times, Rajdeep was contradicted by all his interviewees, who expressed that they are willing to take the inconvenience. If these were the responses received by Rajdeep, he should answer how did he arrive at the 60 per cent figure. If these were the responses received by Rajdeep, he must answer where is the objectivity gone from his journalism. If these were the responses received by Rajdeep, he must answer why is he mixing facts with prejudices. The Press Council of India states that the fundamental objective of journalism is to serve the people with news, views, comments and information on matters of public interest in a fair, accurate, unbiased, sober and decent manner. In fact, Rajdeep knows the answer, he always knew it.